A few weeks ago, two of our friends, Marie and Shane, from graduate school invited us to their house for dinner. This wasn't an ordinary dinner party. 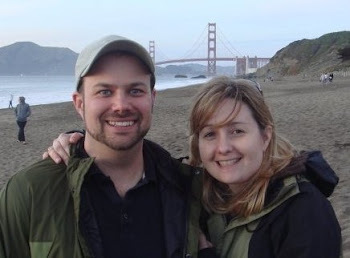 Our two friends, both scientists, were also living on 40 acres of land and raising 70 Mangalitsa pigs as well as working two full time jobs at a biotech company. What dinner might come from the unusual intersection of scientific thinking and an experiment in farming and ranching? Something truly inspiring, delicious and rare in this day. Perhaps the most impressive part of our dinner was the way Marie and Shane have fostered their curiosity and sought the knowledge and ability to prepare food and beverage truly from scratch. Not only are they making prosciutto (see photo above), pancetta, and other delicacies, they are raising the pigs and butchering them themselves. 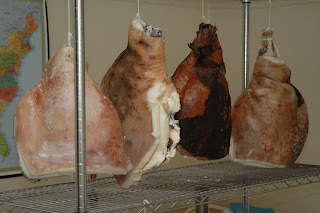 As Shane pointed out, one can see the evolution of their butchering skills in the hams hanging from left to right in their temperature monitored room. What is perhaps most inspiring is that neither Marie nor Shane grew up on a farm or came from a family that had a butchering business. They learned these skills through a butchering class and through hands-on experience. Their willingness to embrace these skills wholeheartedly and engage with food is so admirable. As we walked through the house, each room had an experiment in progress. Shane has been brewing beer for several years and in the garage, it was already on tap as well as some sparkling water! 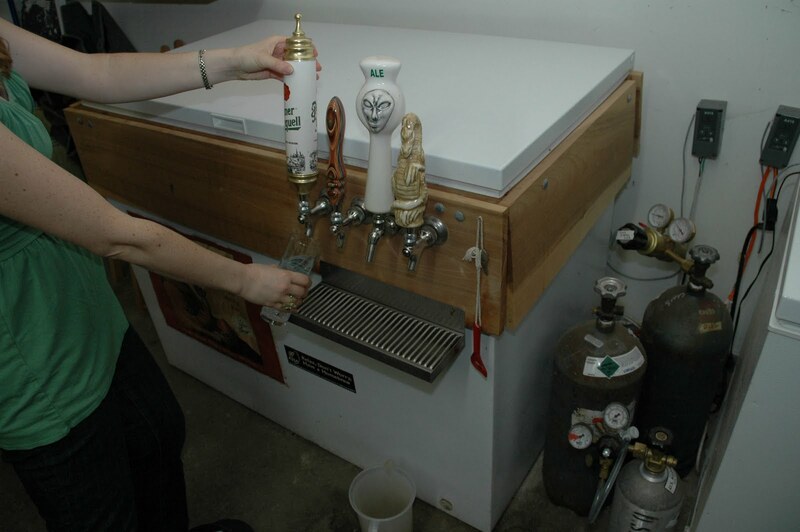 A small insulated cellar was in progress to hold wine and other cured meats as the warm summer approached. 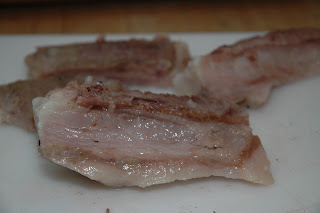 For tonight's dinner, Shane had used his homemade sous vide machine to prepare the pork. 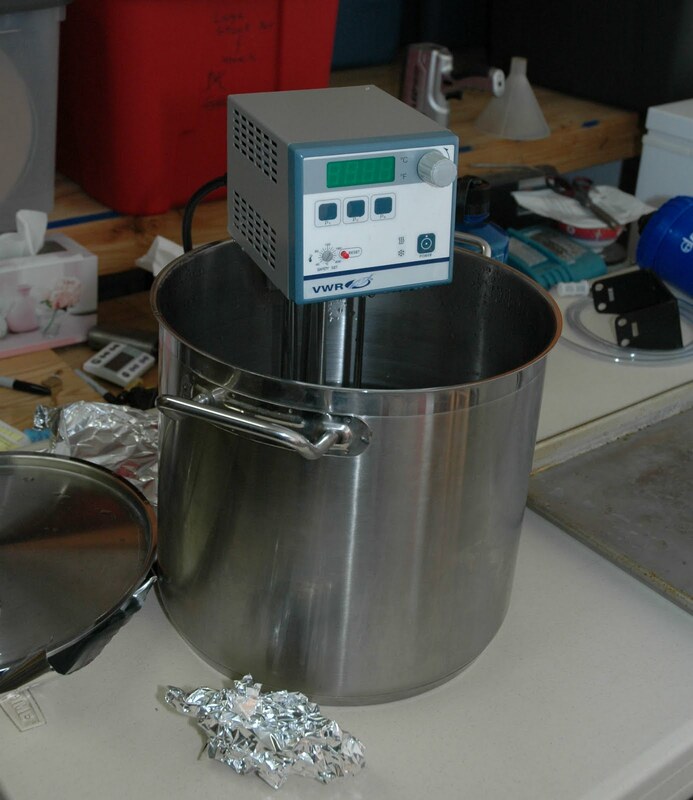 As true scientists, they have purchased a VWR immersion circulator, which is often used in laboratories to heat and maintain water baths with precision and accuracy. This allows them to use any size vessel for the sous vide process and therefore not be constrained by container size. The delicately cooked pork was ready to be finished by searing and browning. We began our meal with a small bite that took me back to my Nonni's kitchen in Weed where homemade sausage and salami was an everyday food. This pork belly was confit or cooked in its own fat. 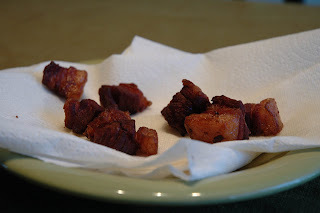 The crispy bits and full flavor of the fatty pieces exploded with flavors that one just doesn't find in the supermarket. The freshness of this pork was obvious in its amazing flavor. After the lovely first course, we were treated to a lovely spinach and beet salad with goat cheese and of course crisped, hand made pancetta. 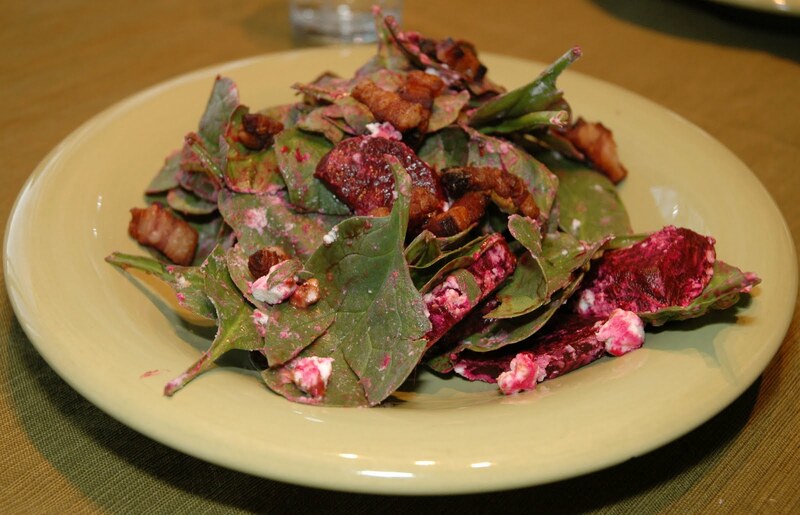 The savory flavor and crispy texture blended so nicely with the bright beets and tangy goat cheese. 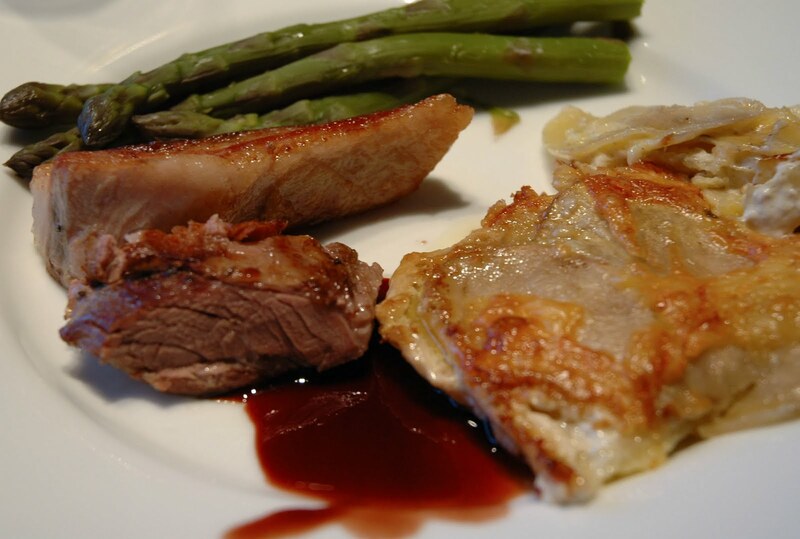 The star of the dinner was certainly this plate with the carefully cooked pork, wine reduction and the best scalloped potatoes we've ever had. Justin and I were charged with making scalloped potatoes for Easter and frankly, weren't very excited until we tasted this version with heavy cream, swiss and mandoline-thin sliced potatoes. In fact, we did go out and purchase a mandoline and opened our copy of Mastering the Art of French Cooking to recreate these potatoes for Easter dinner. By now, we were full. 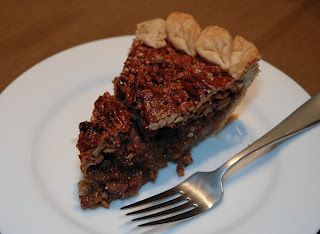 But who could pass up a homemade pecan pie with a crust made from half butter and half lard? It now apparent that we had pork in every course! Lard was the fat of choice that my great-aunt Marie used in her family-famous pie crusts! This pork, Marie assured us, is different than the pink pig pork you have in stores. Because of the breed and feeding regimen, the pork is low in polyunsaturated fats and of particularly high quality. You might see Mangalitsa pigs on reknowed menus such as Chez Panisse or One Market. 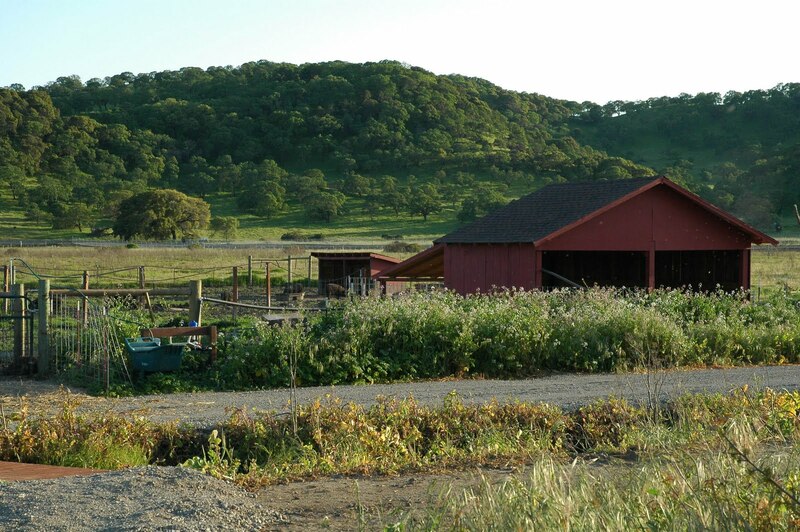 Marie and Shane are the only ranchers of this breed of pig in California. And so it became time for us to leave... we left not only with full bellies but full of foodspiration as well. We're hoping to be invited back this summer when all of their fruits and vegetables are growing for another farm to fork dinner! Coming in our next post: Part 2 A Tour of Marie and Shane's Ranch and Garden. You might just want to start your own pig ranch after seeing this one. sounds so yummy. makes me miss side pork.